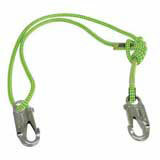 11.5mm" x 3' - 6' Tachyon Polyester Floating Prussic Lanyard Green w/ Blue Tracer. Adjusts for 3' in length to 6'. Contructed with New England popular 24-Strand Climbing line with sewn eyes. Equipped with 5M test double lock snaps.